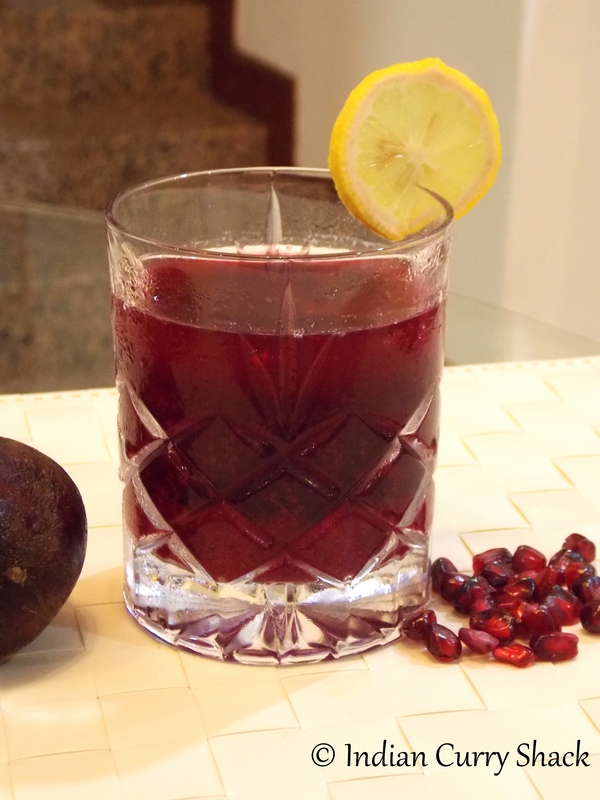 Using a Juicer: Squeeze Pomegranate’s Juice. Add 1/4 glass of cold water and mix. Keep aside. Squeeze Beetroot’s Juice. Add 1/4 glass of cold water and mix. Keep aside. Using a blender: Blend Pomegranate with 1/4 glass of cold water. Then strain the juice from seeds with the help of a strainer in a glass. Blend Beetroot with 1/4 glass of cold water. Strain the juice from pulp with the help of a strainer in a glass separately. In a jug, squeeze lemon juice. Add a handful of ice, sugar syrup and 1 glass of cold water (you can adjust the sugar as per your liking). Give a nice stir. Now add pomegranate juice and stir. Add beetroot juice and more ice. Stir well. Divide the drink equally into the glasses. Optionally sprinkle some chaat masala in the glasses and stir. Garnish with a lemon slice on each glass. Serve chilled the absolutely refreshing Power Punch. I love the festive cranberry color of this drink without the cranberry taste! Thank you so much for bringing this drink to the fiesta. I’m sure it will be all served very quickly. Happy 2015! Love the combination and the use of chaat masala. Innovative! I reckon that is delicious!